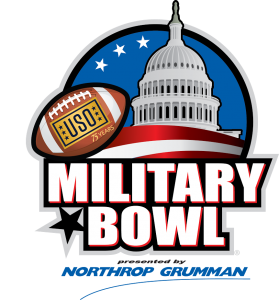 WASHINGTON, D.C. – The 2016 Military Bowl presented by Northrop Grumman, benefiting the USO, will celebrate the nonprofit’s 75th anniversary. Founded in 1941, the military support organization serves as a force behind the forces – connecting service members to family, home and country throughout their service to the nation. The USO operates more than 180 locations worldwide and its staff and 30,000 volunteers offer daily acts of kindness, caring, encouragement and support to America’s men and women in uniform and their families. This year’s Military Bowl, matching teams from the Atlantic Coast Conference and the American Athletic Conference and honoring the USO’s commitment to service members everywhere, will be held on Tuesday, Dec. 27 at Navy-Marine Corps Memorial Stadium. Kickoff is set for 3:30 p.m. ET. The game will be televised on ESPN and features a special Military Bowl logo commemorating the USO’s milestone year. For the seventh consecutive year, the Military Bowl will raise $100,000 for the USO and provide complimentary tickets for active duty personnel and their families. Funds raised will directly benefit the USO of Metropolitan Washington-Baltimore (USO-Metro), which helps distribute the complimentary tickets each year. The Military Bowl will host a pregame USO Reception for VIPs. The USO Show Troupe will perform during the reception and on the field during the game. For the second consecutive year, one of the Military Bowl teams will serve Christmas dinner to service members at the USO Warrior Family Center at Naval Support Activity Bethesda, home to the Walter Reed National Military Medical Center. Northrop Grumman, the Bowl’s title sponsor, is also a sponsor to the Warrior Family Centers at Bethesda and Fort Belvoir. Tickets for the Military Bowl are on sale now. Regular tickets are priced at $25, $60, $70 and $80, with a $150 food and beverage all-inclusive Captain’s BBQ ticket also available. For information on suites and hospitality packages, please contact Director of Marketing & Ticketing Ryan Bartholomew at rbartholomew@militarybowl.org. Navy defeated Pittsburgh, 44-28, as the 2015 Military Bowl was played before a capacity crowd of 36,352, the second-largest attendance in the game’s history. According to figures compiled by Visit Annapolis & Anne Arundel County, the Bowl generated nearly $17 million in direct economic impact in 2015 and has generated more than $47 million in direct economic impact in the three years it has been held in Annapolis.